Adding seed to a failed planting feels like spending good money after bad. Better to add seed to restorations that are doing well and make them great. Back in 2004, Jennifer and Chris Hauser adopted a mature, 14 year old, planting that looked like a keeper. An hour walk through this 15 acre planting gave us 84 species, with a dozen of those being weeds. Way back in 1993 the planting had a horrific amount of white sweet clover which we reduced over the years with timed mowings at full flower, and then careful spot treatments annually after. There is still sweetclover there but manageable. The Hausers are standing in this planting and it looks nice, a keeper. So Jennifer and Chris harvested an additional mass of seed from various species they decided should be there and were not. They picked another 8 pounds per acre of bulk weight of seed. In the fall Chris roughed up the top few inches of soil with a harrow. They then planted the seed on the top with a tractor mounted seed broadcaster, and then harrowed again. From walking around the planting a number of times the following season we felt the harrowing did not harm the plants already established. There was a flush of black eyed susan recruitment (which was not over-seeded but there were 5 to 10 seedling per square foot), and pale purple coneflower (which was planted but it not as much as what we saw which was 1 to 2 seedlings per square foot). So maybe other good things we wanted also germinated. Important to us was that we also did not get a flush of white sweet clover. 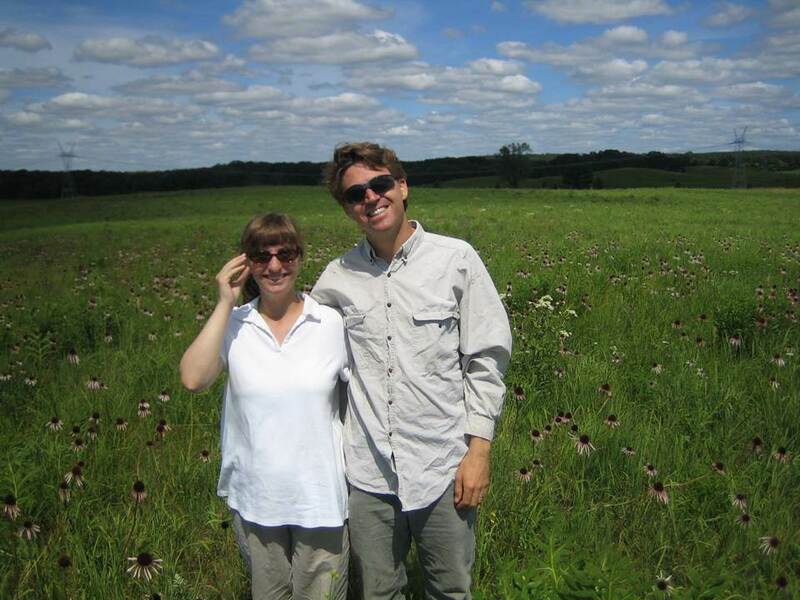 The next year the Hausers had a local greenhouse produce 300 prairie coreopsis plugs and 760 northern dropseed plugs. They plugged these plants in various pods spread out around the planting. They had a wet spring and most of those plugs took and can be seen years later. For several years after they continued to add seed to the planting on a less intense scale. Here and there you find a plant they likely over-seeded. It is a subtle change. We find over-seeding takes five to eight years to show up as flowering plants. This was all a good amount of joyful work. But would you do this on a low diversity planting that had unchecked invasive weed problems? Again, the lesson learned is over-seed successful plantings with more success. Chris and Jennifer Hauser were energetic volunteers with Nachusa for about eight years. Chris did his master work in plant ecology at Nachusa. They moved to Carmel California where Chris works for the Santa Lucia Conservancy. Good food for thought here. Thank you!